Listen, Seattle sweet tooths: Give Neil Robertson a break! His Crumble & Flake has been selling out of scones, croissants and cookies in mere hours (sometimes in just 1 hour!) every day since it opened a few weeks back. So howsabout sharing the love a little bit: Head to Ballard (5427 Ballard Ave NW) this Saturday at 4pm to help welcome Autumn Martin's Hot Cakes! Autumn is a Theo Chocolates alum, and the latest news is that she's teamed up with hot-shot pastry chef Lucy Damkoehler (late of Mistral and Taste). 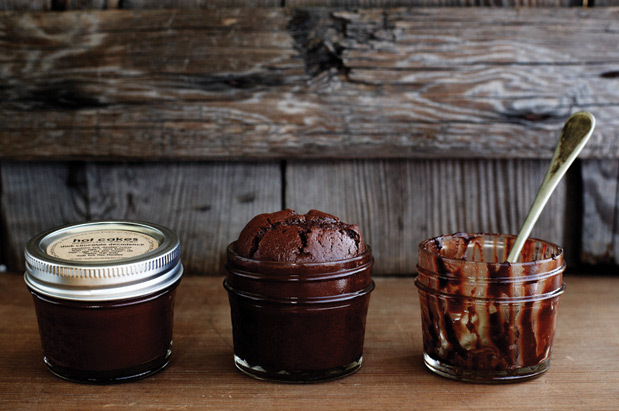 There'll be molten chocolate cakes (like you see above) and lots more: milkshakes, truffles, cakes and so on. Should be tasty!